Sajjad has spent over 15 years in several financial services segments covering hospitality investments, investment banking, financial advisory and treasury management. 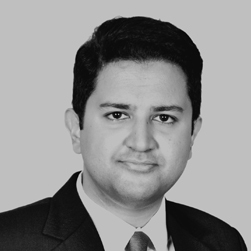 Sajjad’s major areas of work include property/portfolio valuation, cash flow analyses, market and industry research, and special projects focused on increasing portfolio profitability. Before joining Equinox, Sajjad was involved in various roles with the development of King Abdullah Economic City, Saudi Arabia as the Treasury Manager leading the Company’s fundraising efforts. Sajjad has also worked in the Debt Capital Markets (MENA) division at Standard Chartered Bank (SCB). He was part of a team that provided large corporate entities financing of various types. Before joining SCB, he was with the Investment Banking Division at KASB Securities, a corporate finance advisory firm then-associated with Bank of America Merrill Lynch. Sajjad graduated from Ryerson University in Toronto, Canada, with a Bachelor’s degree in Economics.